Indian wildlife sanctuaries and national parks are an ideal place for spotting wild Bengal tigers in their natural habitat. If you are a passionate wildlife photographer and wanted to capture some of the picture perfect shots of the royal Bengal tigers, then travelling to India’s Pench & Tadoba tiger reserves is highly recommended for you. These two reserves are most preferred travel destination among the wildlife enthusiasts and photographers for getting some excellent and unhurried tiger’s photos. 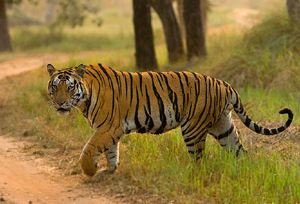 At Tour My India, we offer a special 10 nights and 11 days Tiger Photography Tour to Pench & Tadoba Tiger Reserve. Our tour is perfect for watching and photographing wild Bengal tigers to add to a vast wildlife photo collection. Scroll down to the below given itinerary to know in depth about our tiger sightseeing and photography tour in Pench and Tadoba reserve. On arrival at Delhi airport, you will be welcomed by our representative & transfer to the hotel. Rest of the day is free for leisure OR for your own activities. Overnight stay in Delhi. Morning is free for leisure. After breakfast, transfer to the domestic airport in Delhi to board the flight for Nagpur. On arrival at Nagpur airport meet with our representative & transfer to Pench National Park. Evening is free to explore the outskirt of Pench National Park. Enjoy dinner & overnight stay at the wildlife resort. Pench Tiger Reserve located in the lower southern part of Satpura hills. It is named after Pench River, passing through the reserve from north to south. It is located on the southern boundary of Madhya Pradesh, bordering Maharashtra, in the districts of Seoni. The current area of the tiger reserve has a glorious history of Forests and Wildlife. The area of Pench National Park has always been rich in wildlife. It is conquered by mixed forests with considerable shrub cover and open grassy patches. The topography of Pench forest favours high population of Chital and Sambar & makes it a favourable destination for Wildlife Photographers. 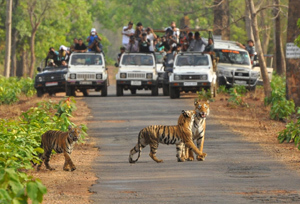 In the morning or afternoon, you can enjoy half day open jeep safaris in Pench national park as per your convenience. Later, take pleasure of a night stay at the wildlife resort. Tiger Safari in an open Jeep is an eminent and electrifying safari, which offers a new aspect of Pench National park’s flora and fauna. If a Photographer wants a close and invigorating look of animals in their natural environments, then open jeep safari is a paramount choice. If you want to have some outstanding and rare photos of wild animals of the park, then jeep safari is the finest option. Jeep safari is also the best way of spotting tiger. After 03 days of safaris at Pench Tiger reserve, today we will relax at the resort in the morning, have breakfast, take some rest and then drive to another Tiger territory, which is paradise for Wildlife lovers. Arrive at Tadoba in late afternoon. Evening is free for leisure. Enjoy dinner & overnight stay at the wildlife resort. Tadoba Tiger Reserve is part of the Chandrapur District of Maharashtra and an important Tiger photography destination in Central India. Tadoba Tiger reserve protect the Tiger and the absolute variety of unique Indian wildlife. Along with around 40 tigers, Tadoba Tiger Reserve is a home for other wild animals like, Leopards, Sloth Bears, Gaur, Hyenas and also for many species of Indian deer like Sambar, Chital, Nilgai and Barking Deer. There is no doubt in the fact that to witness the exotic wilderness & for Tiger Photography, the recommended reserve to go is Tadoba Tiger reserve. All 03 day’s morning & afternoon half day open jeep safaris for Tadoba Tiger reserve from different entrance gates to cover maximum area of the Tiger reserve. Overnight stay at the wildlife resort. 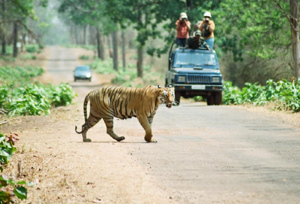 One of the finest places to see tigers in India, Tadoba Tiger reserve can be explored in open jeeps. 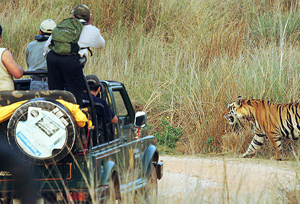 This method of excursion is known as tiger safari and is usually of few hours. The jeep safaris are organized in the morning and evening with a break in between. The open jeep ride offers a wide view of the habitat and a chance to see tigers and other wild animals.